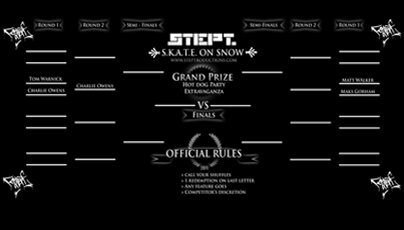 Stept Productions' is proud to to release the second game of Round 1 of S.K.A.T.E On Snow, the game everyone loves, brought to you by Stept and the best rail riders in the world. There are 16 Games until a winner is crowned, and the game will have several special guest riders who are not in the Stept Crew. This is sure to be the rail battle of the year, so check out Round 1.2 below, featuring Matt Walker vs Maks Gorham, and stay tuned for the next game! For more information on S.K.A.T.E On Snow, check out steptproductions.com.